Midlands area high schools hold their graduations in Colonial Life Arena starting this Thurs., May 31 for the next 10 days. Faculty, staff and students in the area may experience more traffic than usual. The University of South Carolina’s Parking and Transportation Services is providing shuttles for all visitors [pdf] from the Pendleton and Blossom St. garages. Please exercise patience, as you may experience congestion and higher traffic during those days at the lots around Colonial Life Arena. 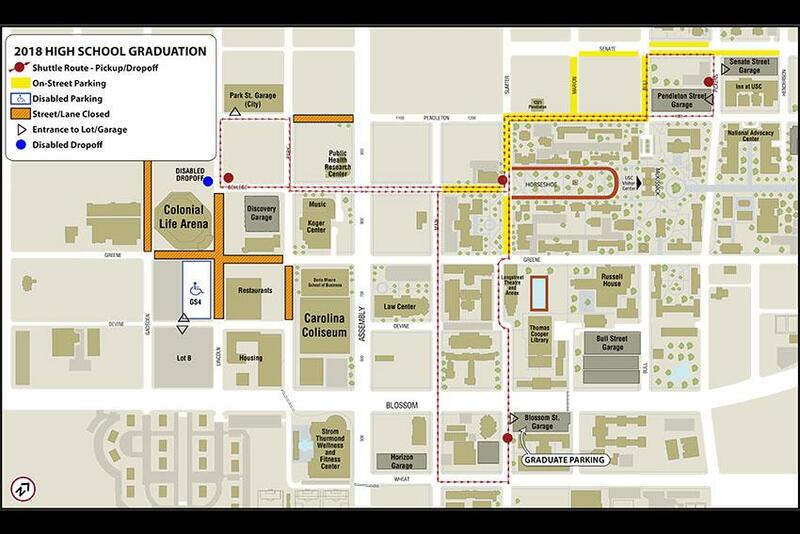 Lincoln St. from College to Devine St.
Greene St. from Gadsden to Park St.
Get from your parking garage to the Colonial Life Arena with ease by using the 2018 High School Commencement Shuttle map.